Your dog's eyes should always be clear and bright. Green discharge coming out of a dog's eye is a sign of a health problem and is often a sign of conjuctivitis. Conjuctivitis is an inflammation of the conjunctiva, the tissue lining the eyelids and connecting to the eyeball close to the cornea. The conjunctiva can become irritated due to allergies or from infections caused by viruses or bacteria. It could also be a sign of dry eyes, glaucoma, or corneal ulcers. Regardless of the cause, you should treat this condition immediately. Put on the rubber gloves and examine your dog's eyes. Look for tissue damage or signs of injury. If you see such signs you should take your dog to a veterinarian. If there is no sign of injury and your dog is behaving normally proceed to Step 2. Rinse your dog's eye with a saline solution by dipping cotton balls into the solution and wiping your dog's eyes with it. Use a clean cotton ball for each wipe to avoid reinfection. Monitor the dog for several days. 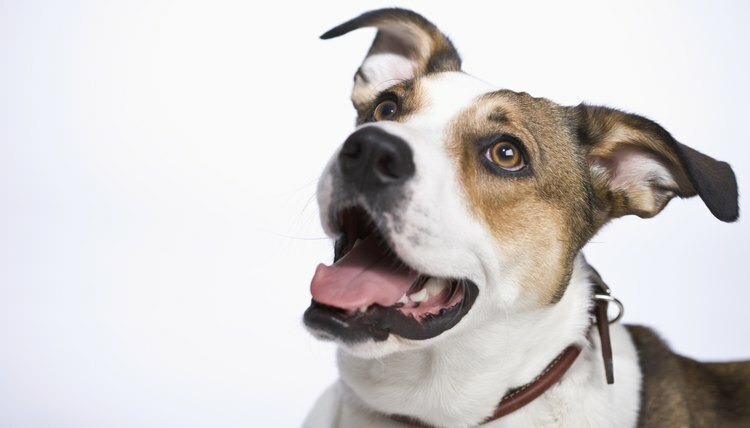 If there are no more signs of green discharge, you have effectively treated your dog. Create an herbal eyewash for the dog. The following herbs have powerful anti-inflammatory properties: Chamomile, Golden Seal, Echinacea, and Gotu Kola. Infuse any of these herbs in warm water, wrapped in a coffee filter in a small bowl and add it to a saline solution. Dip a cotton ball in this solution and wipe it across your dog's eye. Throw away the cotton ball immediately and repeat this process with a fresh cotton ball. Repeat this process until there is no more visible discharge. If none of these tactics work for your dog or of your dog is scratching or pawing around his eye, take him to the veterinarian immediately. Monitor your dog's eyes regularly. Carefully trim the area around their eyes to prevent it from bothering him.